While several American companies await FDA approval for blood pressure monitoring using similar optical blood flow measurements used by many fitness trackers, there are several foreign manufactures that have already made these devices available for purchase. I think we’ll be seeing blood pressure monitoring on big name fitness trackers eventually but until then we have other options. I want to point out that this watch is NOT FDA approved so it hasn’t gone through their rigorous testing and therefore it isn’t a medically approved device. You’ll want to work with your doctor to monitor your blood pressure and use FDA-approved home blood pressure monitors. Omron® has several models to choose from and they are also awaiting FDA approval of their own blood pressure watch which will hopefully be coming this year. The following data contains several blood pressure readings that I took of myself, comparing the Jesam Fitness Tracker, the SN60, to a wrist blood pressure monitor and a more traditional upper arm cuff. If the Jesam isn’t available on Amazon, you can try this one also on Amazon. It’s the same thing but without an extra watch strap and the watch case is in black instead of silver. It’s very important to take your blood pressure in the recommended position. Omron suggests sitting at a table with your feet on the floor and your arm supported by the table but make sure you read the instructions for whatever monitor you have. I highly recommend having a FDA approved blood pressure monitor, in addition to any watch you may want to use to monitor your blood pressure with to ensure that the watch is reasonably accurate. Also, it’s a good idea to take your Omron or whatever device you’re using to your doctor’s office and make sure it is accurate. My doctor’s office will let me come in with my blood pressure monitor and have it tested against their equipment for free. At any rate, whatever you’re using to monitor your blood pressure make sure it is accurate and that you know how to properly use it. First of all, the build quality of it is very nice. The body is composed of a zinc metal alloy and the watch is water resistant for swimming. It has a rating of 5ATM which means it can withstand water pressure at 50 meters of depth. I really like the look of the watch. Of course, it is reminiscent in size and shape of the Apple Watch and the Amazfit Bip. The Jesam Fitness Tracker I purchased through Amazon also came with two watch straps, a black metal milanese one and a rubber/silicon (it didn’t specify what it’s made of) sport band. I preferred the sport band of the milanese for comfort and fit. The OLED screen is made of Gorilla Glass which should make it more scratch resistant than your typical budget fitness tracker. The display is .96″ so it doesn’t fill up the entire space under the glass but I find the size of the text readable. In sunlight, the screen is difficult to read however. This is typical of OLED displays unless you can adjust the brightness for outdoor conditions. Unfortunately, you’re not able to with this particular watch. A touch sensitive area at the bottom of the screen is used to navigate through the watch menu. There’s no physical buttons on the watch. Two watchfaces are available and to set the one of your preference just long press on the touch sensitive area and you’ll be able to select the one of your choice. For the health features, (heart rate, blood pressure, blood oxygen) a long press on the Health screen and on the Sports screen will bring up other menu options. Once you navigate to the option you want to select, long pressing again will start the activity or health reading. I would give the SN60 an A grade if it wasn’t for the fact that I feel the screen times out too quickly. This can be really annoying. Also, I wasn’t able to change the temperature reading to Fahrenheit from Celsius, even though there’s a setting in the app to do this. It isn’t supported. The same is true for changing kilometers to miles. Kilometers still display on the watch and I’d prefer miles. A positive thing is that the watch has received firmware updates. I upgraded to the latest one after receiving the watch and it looks like there had been a number of other updates prior to that. This is a good sign because a lot of your cheaper activity trackers rarely receive firmware updates. Since updates are being pushed out, it shows a commitment to continued improvements which is very important. GPS or connected GPS isn’t available for any of the activities on the watch. Instead, sensors built into the watch are used to calculate distance. 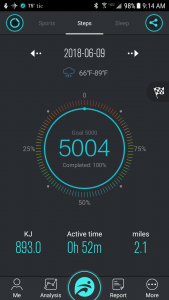 However, you can use the app for the watch (Fundo Pro) to use the GPS on your phone but it isn’t used in conjunction with the watch, so no heart rate data is captured. 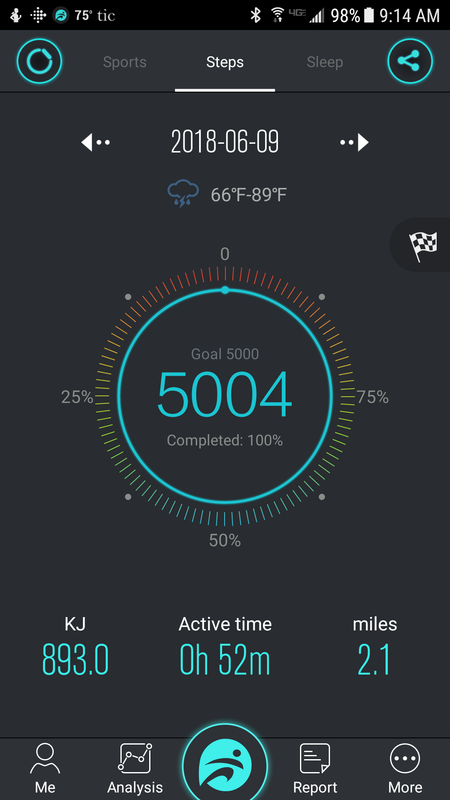 So basically, the activities through the Fundo Pro app are just using sensors on your phone. I found step tracking to be pretty accurate in my tests. I walked 100 steps and it counted 101 and then I walked 200 steps and it counted 203, so not too bad. It also isn’t like a lot of the more inexpensive fitness trackers I’ve tried lately that don’t count your steps if you walk less than 100 or so each time. For instance, some I’ve tried will zero out steps I’ve taken if my walk only consisted of 20-30 steps. I can literally watch it zero out those steps. They do this to ensure that arm movements that aren’t related to steps aren’t counted as steps. However, the SN60 will count everything that it believes is a step and after tossing and turning in bed my Fitbit Versa counted a few of those movements as steps but the SN60 didn’t, so I don’t think it’s picking of false steps. So, I was happy with step counting. Another area in which the SN60 testing well is heart rate accuracy, both for resting heart rate and during sports activities. It tested better for resting heart rate but pretty good for activities. Once in a while during an activity in which it looks like the watch takes a reading every 3 seconds, or at least that’s what is recorded in the app (and yeah you can see all that data!) 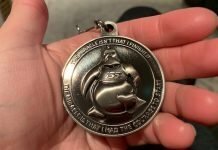 it showed my heart rate temporarily lower than it actually was compared to the Garmin Fenix 5s, my most reliable fitness tracker and GPS watch. It’s pricey but it’s the best I’ve ever tested for fitness tracking but it doesn’t measure blood pressure or blood oxygen. These dips were fairly infrequent, short and temporary and it recovered to display a more accurate reading within 15-20 seconds. It did great when I was running on the treadmill, matching exactly my peak heart rate displayed on the Fenix. 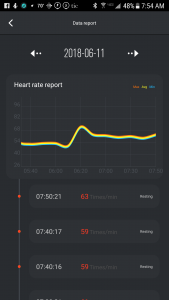 The SN60 doesn’t read your heart rate continuously 24/7, second-by-second but you do have the option to have it read your heart rate as frequently as every 10 minutes and this data is stored in the app. However, it doesn’t automatically read your blood pressure or blood oxygen. This you have to do manually through the watch. 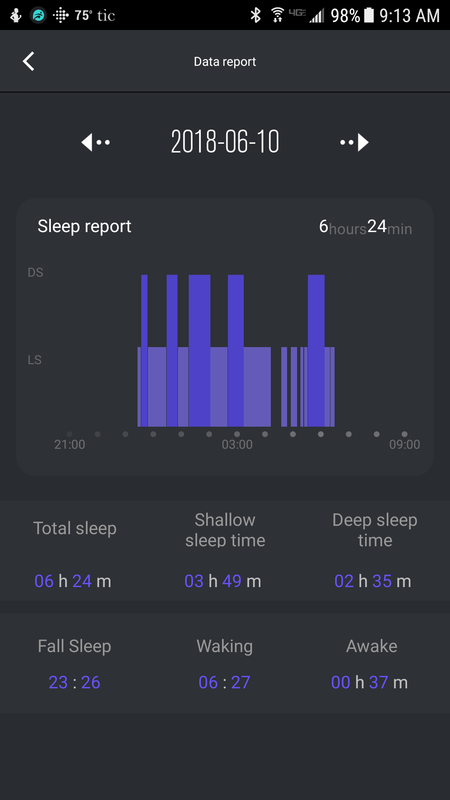 Sleep tracking was okay compared against the Fitbit Versa. It will only detect sleep from I believe 9 pm and 9 am, so if you sleep outside of that range it won’t detect it. 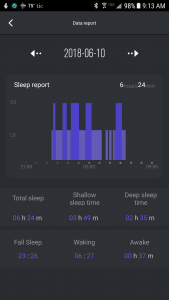 Also, if you get up in the night and take a few steps, and then go back to sleep it won’t detect that additional sleep time. I’m not sure how many steps you have to take before it thinks you’re really awake because I got up a couple times during this particular night to calm my dogs down during a thunderstorm and it continued tracking my sleep. I guess it just depends how many steps or how much movement it thinks you’re doing. I’m not 100% sure. I do want to point out that the app didn’t always match what the watch said for my sleep. Sometimes it double counted or combined two nights sleep into one. The watch continued to show the correct time that I slept but the app was a little goofy at times. Hopefully, an update of the Fundo Pro app will address this issue. This is a biggie! The main reason why I chose this watch is because it does support blood pressure and blood oxygen readings and there’s a lot of interest in activity trackers being able to support these features. I found the blood oxygen readings to be accurate so that is good. For blood pressure, the results were mixed. 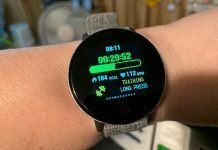 I have reviewed other blood pressure watches and the Tom Tony so far has tested out the best for me since it allows calibration through its app. The SN60 doesn’t have this feature which is disappointing because it’s really necessary to obtain more accurate results. 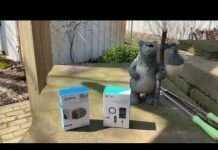 Below are the results of several tests I did comparing the SN60 versus two different Omron blood pressure monitors: the Omron Series 3 Upper Arm Blood Pressure Monitor and the Omron Series 3 Wrist Monitor. Some of the test also include data I obtained from the Tom Tony watch I reviewed last year, so you can see the difference calibration makes. These tests were taken over a 3-day period at different times of the day. Just for kicks, I also tested my heart rate using the wrist and upper arm monitors, on different arms, at the same time and the readings were wrist 121/70 arm 122/74. So, there’s usually a little bit of a discrepancy between blood pressure devices, even very good ones. *You might have also noticed that I tested twice when I got a higher reading. The second time it tested lower, so you can see there can be quite a difference between two readings taken just a couple minutes apart. I think I have enough evidence to conclude that the SN60’s blood pressure readings were off by too far of a margin most of the time. Also, it was giving my pretty much the same results each time. Maybe with some tweaking of the firmware it could be improved. If the watch could be calibrated through its’ app, we’d probably see improved blood pressure accuracy but until then, it appears to be off. The SN60 tested out well for step tracking, heart rate accuracy (especially for resting heart rate), blood oxygen estimates, build quality and comfort, and did reasonably well during sport’s activities. Notifications also came through reliably, although I did have to reconnect it to Bluetooth on my phone, a Galaxy S7, one time. Battery life is decent. You should be able to get 5 days out of it before needing to recharge it. It is a good looking and appears to be a well built fitness tracker. There’s a lot to like. 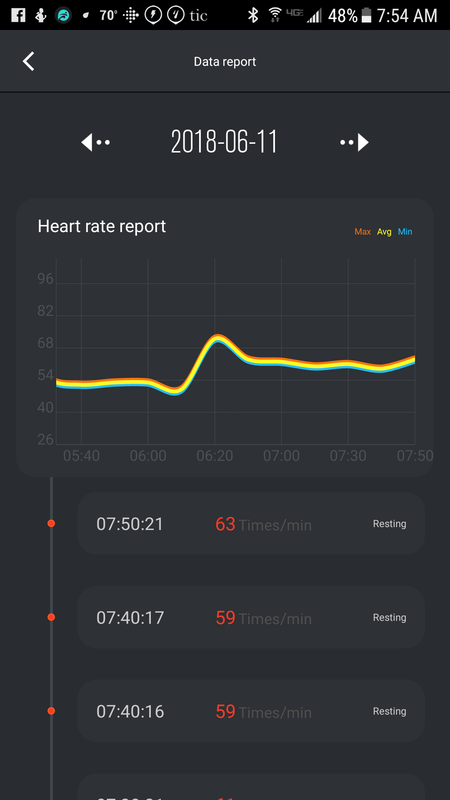 Its’ shortcomings are inaccurate blood pressure readings, a screen that times out too quickly, and the Fundo app could use some improvements as well. The app has lots of data but you really have to go fishing for it. I graded the app a C-. If you’re looking for a watch to monitor your blood pressure, you’ll probably want to look elsewhere. The Tom Tony has tested out better for me since I was able to calibrate the blood pressure through its’ app but it also isn’t FDA approved, so keep that in mind. We may have a FDA approved watch from Omron later this year or maybe even from Apple in a year or two but until then, make sure to keep those more traditional blood pressure monitors at home if you want to keep an eye on your pressure between doctor appointments. Tom Tony has a new watch out that is next on my list to test and it also tests blood pressure. The Tom Tony P3 fitness tracker, currently on Amazon looks promising so keep an eye out for that review in the coming weeks. Update: the review on the Tom Tony P3 is available and it tested well! 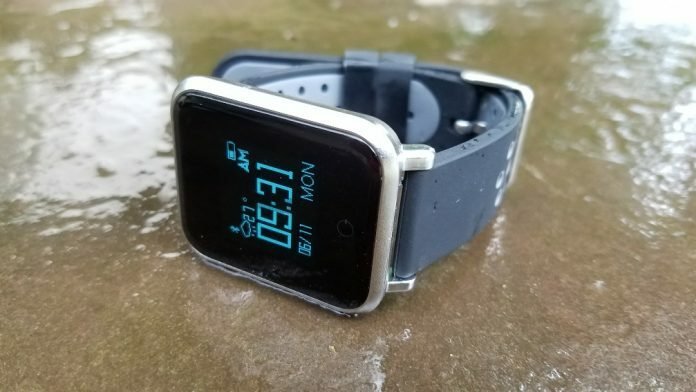 The SN60 is a good looking watch that is comfortable to wear, has a great water resistant rating, and tested well for heart rate and step counting. It also did well with blood oxygen estimates. Where it fell flat was blood pressure accuracy and a mobile app that needs some tweaking.